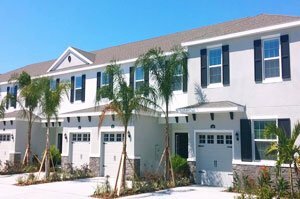 Baytown Square is a gated community which consists of 89 townhomes in the laid-back east Bee Ridge area of Sarasota. Its site is tucked north of the junction of Bee Ridge Road and Mauna Loa Boulevard, a popular search destination for hunters of Sarasota homes for sale. This community’s acreage is just west of Sarasota Golf Club Boulevard and is less than a mile east of Interstate 75 which opens easy access to various points of interest in Sarasota as well as Manatee County. Towards south across Bee Ridge Road, the single family homes of Lake Sarasota share the Baytown Square locale. The privacy and security that is typically paramount on the requirements of buyers of Sarasota homes for sale is also a strong buying come-on for Baytown Square, as it is a gated and private enclave. This community is a development of national homebuilding giant D.R. Horton which ensured that the community’s residences derive the most out of their splendid setting. The four decades of D.R. Horton’s homebuilding experience is in full display on the homes for sale in Baytown Square. This Fort Worth, Texas-based builder designed the community’s residences as two-story, villa-type structures with their architectural design reminiscent of the elegant Mediterranean revival style. Baytown Square’s townhouses are of concrete block construction and with energy-efficient materials used in their builds. D.R. Horton offers two floor plans—Coronado and Solana—in this community. Both layouts have three bedrooms, two full bathrooms and a guest room, plus a one-car garage. The Solana features a floor area of 1,674 square feet while the smaller Coronado provides a floor space of 1,530 square feet. Pricing of these townhouses are quoted in the attractive $200s range. These models flaunt contemporary features including granite countertops, covered balconies and private lanais that provide serene water views and refreshing vistas of the community’s green areas. 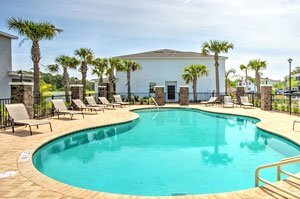 The residents can also enjoy more besides Baytown Square’s tropical Florida setting. Baytown Square is a maintenance-included development, so its residents can fully enjoy the community’s facilities as well as the life and leisure activities in the various lifestyle centers nearby. For starters, they can enjoy the community’s exclusive swimming pool with cabanas amidst lush landscaping. The residents can also have a unique experience at the Sky Zone Trampoline Park which is walking distance from the community. School-age kids living in Baytown Square, in addition, can enroll at Tatum Ridge Elementary, McIntosh Middle, and Sarasota High School. For golf and related activities, optional country club memberships could be accessed and privileges enjoyed at Bent Tree, Laurel Oak and Heritage Oaks. All of these clubs just a few minutes’ drive from Baytown Square. Less than a mile away, shopping is convenient at the Centergate Village on Cattlemen Road, which has a Walmart Supercenter, a Publix supermarket, and a Home Depot. More choices on retail outlets can as easily be accessed at the Mall at the University Town Center with a short drive northward on Interstate 75. Driving to downtown Sarasota or to Siesta Key’s popular beaches would only take about half an hour to further broaden the joys of living at Baytown Square. 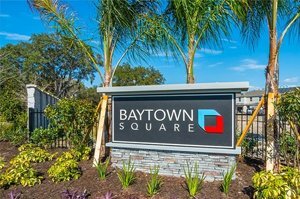 Below are the current real estate listings available at Baytown Square.